Troy Reimer at SNAPPS has created LotusScript classes for parsing and creating JSON text. These classes are contained within five script libraries. There is a JSONReader and a JSONWriter class together with some wrapper classes including JSONArray and JSONObject. The JSONWriter class is really cool. You can pass it basically anything Notes data related and let it create the JSON for you. This is really handy for passing a NotesDocumentCollection to the class and let it return perfect JSON to the browser or whatever called it. This class provides two ways of outputing JSON text. The first is to pass an array, list, NotesDocument, NotesDocumentCollection, NotesView, NotesViewEntryCollection, or NotesViewEntry to the ToJSON method. This will render the object as JSON. If the object is a type of view object, the output will be taken from the column values. The output data is basically the same as the properties/values of NotesViewEntry. If the object is a document, its output follows the NotesDocument properties/values. Rob, Jerald, Troy and I are back home at the office after a very exciting week at Lotusphere 2008. As always I wish I could have attended more sessions but with 5 sessions this year I just ran out of time. 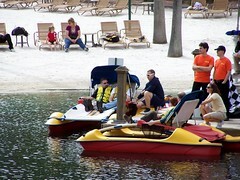 Monday Carl Tyler and I had our heat in the annual Lotusphere Boat Race. Carl could not attend the final on Thursday because of his early flight back home but Troy Reimer from SNAPPS filled in and we finished in 3rd place. Tuesday morning Troy and I presented BP205 – Extending and Customizing Templates for IBM Lotus Quickr. It was very well attended and even needed a overflow room. The presentation and demo files can be downloaded here. Tuesday night Rob Novak and I presented a cut down version of that session (in 5 minutes) 12 times at the Speed Geeking event. Wednesday after lunch Troy and I had our very first Hands-On-Lab at Lotusphere: HND305 – Building Custom Themes for IBM Lotus Quickr and it was repeated the same afternoon by Jerald and Troy. A full room in the morning and almost full in the repeat in the afternoon tells me that we need to do this lab next year as well. Session materials can be downloaded here. Wednesday afternoon Rob and I presented our session: BP212 – The Great Code Giveaway: “Beyond Cool”. This was the third year we presented a “Code Giveaway” session and it was very well attended. We went over 12 demos in 1 hour and it was a lot of fun. Session materials can be downloaded here. Wednesday night party was a blast at Universal Studios – Islands of Adventure. Jerald, Troy and I made it to a few of the rides. 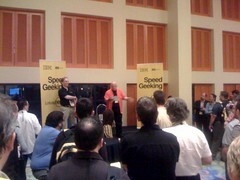 Thursday morning Rob and I repeated our BP212 – The Great Code Giveaway: “Beyond Cool” session at 10 AM. To see the room almost full that early the last day of the conference was very exciting. Thursday afternoon Rob and I also sat on stage for the annual “GuruPalooza” session. 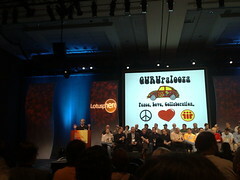 It was a great Lotusphere and I really hope to be at Lotusphere 2009. I’ll see you there. Free webinar: Taking the Guesswork Out of Selecting a Solution for Modernizing Your Domino Applications. The postings on this site are my own and don’t necessarily represent my employer’s positions, strategies or opinions.